This recipe is a modification from the Living Without magazine (November 2012 issue). Combine flour and salt, then cut in butter substitute using a pastry blender until mixture resembles coarse meal. Sprinkle with coconut milk, one tbsp. at a time, while blending, until all ingredients are moist. Using wax paper, place dough onto one sheet, flatten with palm, place another sheet on top and roll out to desired size. Remove top sheet of wax paper and carefully place on top of a cookie sheet (or pizza pan) that is lined with parchment paper. Peel and discard wax paper. Pinch up the sides of the dough for tart edge. Sprinkle dough with sugar. Preheat oven to 350°F. Mix apples and cranberries with lime juice. In a separate bowl, combine starch and sugar. Add to fruit and toss until fruit is thinly coated with dry ingredients. 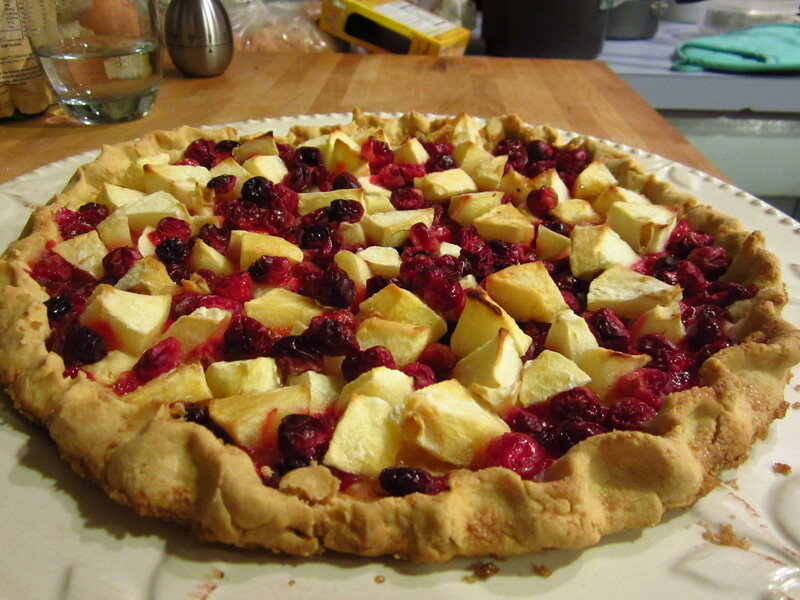 Place fruit mixture on top of tart dough. Place in preheated oven and bake 35-40 minutes until cranberries pop and filling is bubbling.